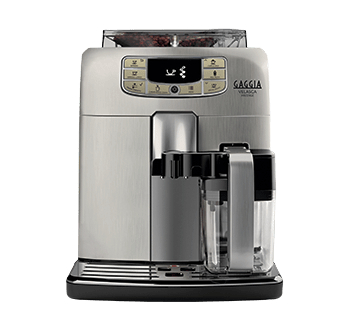 What is the difference between a superautomatic and a manual espresso machine? What is the difference among the integrated milk carafe, the cappuccinatore and the traditional pannarello? How can I prepare my favourite espresso? How can I change the grinder settings? Do grinding, Optiaroma and pre-brewing affect the taste of coffee? Which kind of milk can I use to get an impeccable froth? How can I memorize the quantity of coffee? Why does my espresso machine automatically start a rinsing cycle? What descaler can I use? Which water filter can I use? 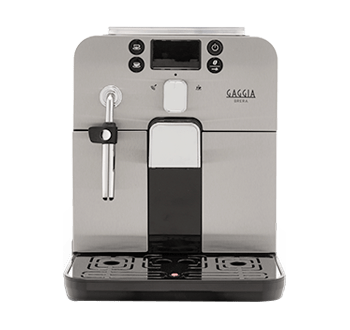 Where can I buy a Gaggia full automatic espresso machine? The classic Pannarello is the right tool to unleash your inner barista. It dispenses steam to prepare gorgeous cappuccinos, latte macchiato and more, or hot water if you prefer teas. 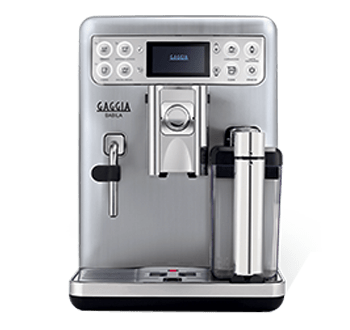 Thanks to the rotating knob, you can select the quantity of ground coffee among 3 different levels, to easily personalize the intensity and taste of your espresso. The long lasting 100% ceramic grinders extract the purest essence from coffee beans, preventing overheating and burning. This material guarantees long-lasting performances, silence and the best in-cup result. Select among 5 options to customize your espresso, from the finest grind for a strong taste, to the coarsest for a lighter coffee. Customize and memorize the length of the available beverages simply by keeping selected the button for a few seconds. 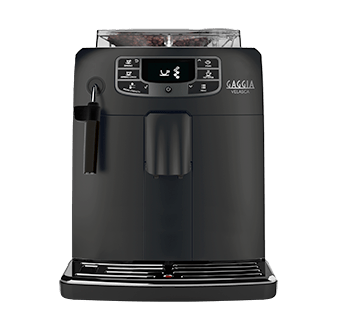 To ensure a deep cleaning of the machine and a long-lasting performance, Naviglio Black is equipped with a removable brew group, an automatic system that cleans the coffee circuit, and dishwasher-safe Pannarello and drip tray. Your Naviglio Black espresso machine is easy to use thanks to the direct access to the water tank and the practical coffee pucks container. If you prefer to obtain excellent results in a fast way, a superautomatic machine is what suits you the best. 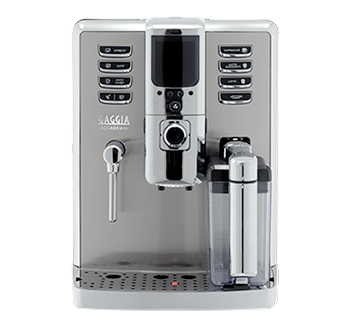 Equipped with a patented brew group, makes espresso, cappuccino and other hot beverages just by pressing a button, that can be customized as you prefer in a few easy steps. Moreover, the integrated 100% ceramic grinders let you have freshly ground coffee at every use and preserve all the aromas. While, if you like to relive the barista rituals at home, a manual machine is the right choice. Learning how to make an impeccable espresso requires care and practice, but it is definitely worth it. 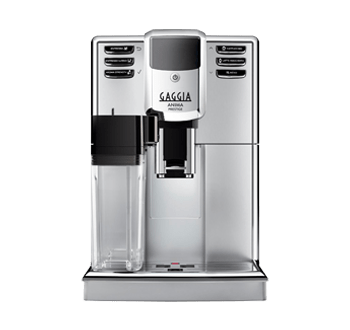 The integrated milk carafe, directly connected to the machine, gets activated automatically when you select a milk-based drink. The system froths the milk twice to get you an impeccable froth, always at the right temperature, to make flawless drinks, according to the traditional recipes. Moreover, the carafe can be stored in the fridge after using it. The cappuccinatore has a patented cyclonic chamber that draws milk directly from a container, froths it and delivers it automatically into a cup. The traditional pannarello is a manual tool that dispenses steam to create a dense and soft layer of milk froth to enrich your coffee, as well as hot water if you prefer teas or infusions. 1. Always select high quality blends. Blends with Arabica are characterized by a higher acidity and a more aromatic flavor, while blends with more Robusta have a stronger taste. 2. Be sure to turn the machine on a few minutes before using it, so it can properly warm up. This guaranteees a perfect extraction of all coffee aromas. 3. Use the Optiaroma function to set the quantity of ground coffee used. It is possible to select among 3 different settings: light, medium, strong. Press the button; the new setting will be saved with the first espresso brewing. 4. Set the length of your espresso via the MEMO function. For a traditional Italian espresso, set it to 30ml. 5. Activate the pre-brewing for an even more intense flavor. A first hot water shower moistens the ground coffee before the actual brewing, so to extract all coffee aromas. 6. 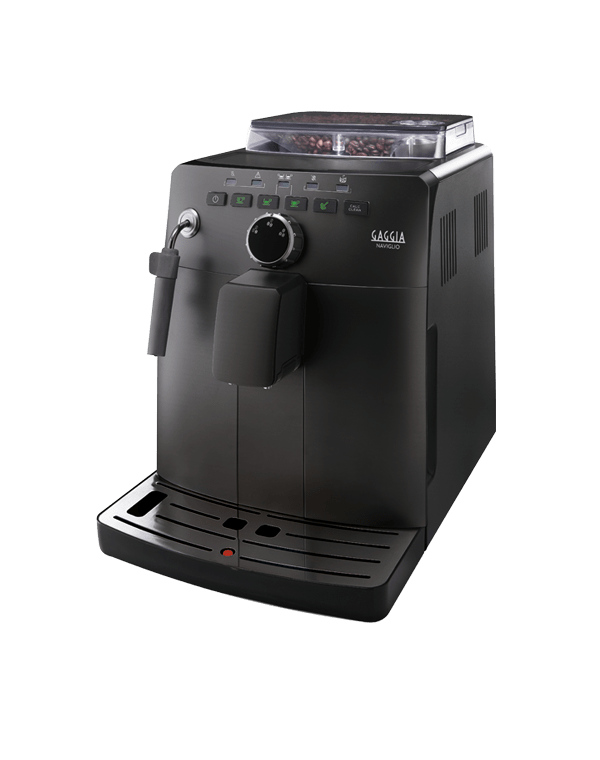 Adjust the grind size among the 5 available selections by pushing and turning the knob inside the beans container with the key, only when the grinders are working. For a stronger taste or for light roasted beans, choose a finer grind, while for a lighter taste or dark roasted beans, select a coarser grind. It is possible to adjust the grinder settings by pushing and rotating the knob inside the coffee beans container by using the grinder adjustment key, one notch at at time, and only when the machine is grinding. You can choose among 5 different settings, from 1 – the boldest (for light roasted coffees) to 5 – the lightest (for dark roasted beans). You will taste the difference after 2-3 brewings. For the 120V models, this adjustment must be done by following the same procedure but only when the grinders are NOT working. A correct grinding is fundamental to make the authentic Italian espresso: not too coarse or you’ll get a watery coffee and not too fine or coffee won’t come out. Moreover, different beans react best with different grind sizes. Optiaroma allows to regulate the amount of ground coffee used per cup, for a light or strong taste according to one’s preferences. Adding more coffee makes it harder for the water to go through, slowing down the extraction time and resulting in a stronger coffee. Pre-brewing affects the intensity, and could be set to have a stronger coffee. With this process, ground coffee are moistened with hot water for some seconds before the actual brewing, releasing a wider range of aromas. It is possible to customize and memorize the length of coffee simply by pressing and holding the button for a few seconds until “MEMO” is displayed. The machine starts brewing. When the desired quantity has been reached, press again the coffee button. The length is memorized for next uses. Yes, you can use mineral still water or tap water. Avoid sparkling water as it can negatively affect the brewing process. 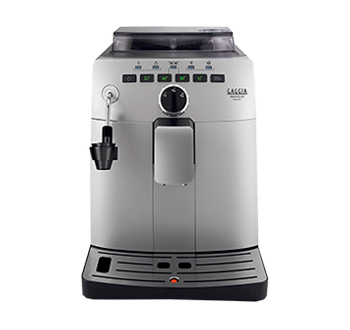 This automatic rinsing cycle – that happens when the machine is switched on or goes in stand-by mode – is necessary to keep the circuits always clean and to heat the coffee circuit to guarantee an extraordinary result from the first use. Scale is a normal consequence of using the machine, and it depends also on the quality of the water you use. It is necessary to descale the machine when the display alerts you to proceed. 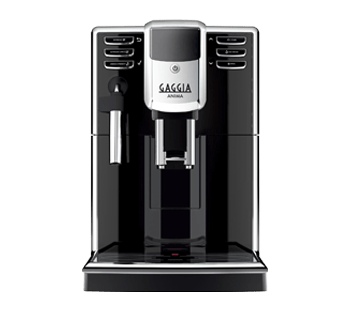 We suggest to follow the step-by-step procedure illustrated in the instruction booklet and to use only the GAGGIA descaler that is especially thought especially for our espresso machines. 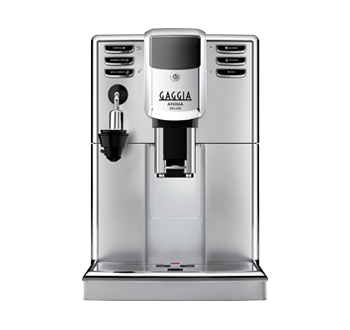 To descale your Gaggia coffee machine use only the Gaggia decalcifier, a unique solution made to ensure excellent performances of the machine throughout time. Vinegar and any other descaling agents must be avoided. Never use descaling agents based on mineral acids such as sulfuric acid, hydrochloric acid and sulfamic acid. These descaling agents may damage your coffee machine’s pipe and tube system. 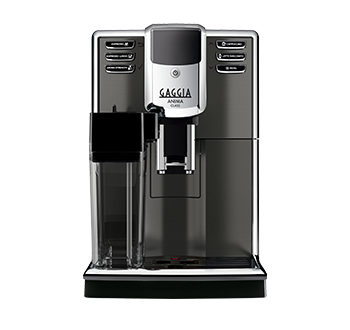 The Gaggia Naviglio range is compatible with Brita/Mavea Intenza+ water filter, especially designed to protect the machine against scale. Drip tray, drip tray plate, coffee pucks container, water tank, pannarello, cappuccinatore and milk carafe are removable and need to be washed under tap water, with a bit of dish soap, but no abrasive substances nor solvents; the removable brew group must be washed with no soaps. The drip tray plate can be washed also in the dishwasher. You can find our official distributor for your Country in the contacts section: http://www.gaggia.com/worldwide-en.